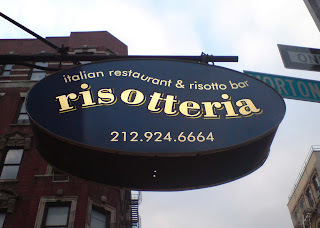 Risotteria is a tiny restaurant in Bleecker Street in the heart of Greenwich Village in New York City. On a cold, clear April evening, I was about to walk right past it – it doesn’t look like much from the outside. Once you are inside, you are in for a treat. We had dinner twice in this very special restaurant. The food is delicate and delicious and the service is friendly. It is a very small restaurant, though, so be you won’t have much privacy. Personally, I found this to be part of the charm. Greenwich Village is my favorite part of NYC and Risotteria is located conveniently close to the subway stop on 4th Street/Washington Square. There are plenty of interesting stores in the neighborhood to browse while you work up an appetite. The food is quite affordable – cheep when you consider the quality. We shared a starter, had a risotto each and a bottle of quite nice red wine to wash it down – all for 50 USD. Like I mentioned, Risotteria is a bit on the small side and it can feel a bit hectic. But it is a charming place and the people who come and go are part of the experience. As the name implies, this restaurant specializes in risottos. You can choose from 35 types of risotto; some based on Arborio rice, some on Vialone nano and some on Carnaroli. I tasted three differrent risottos and they were all to die for. Vialone nano with italian parsley and white truffle oil was a dream. There is a nice little selection of Italian style starters and a lot of interesting salads on the menu. If you are not in the mood for risotto, there is a selection of panini and a lot of pizzas; some with tomato sauce, some with olive puree and some with pesto as a base. If you are a vegetarian, more than half of the menu at Risotteria is for you. The restaurant also specializes in gluten free food. All of the pizzas and panini are available as gluten free. It is really a great tips And this is a great advice for all who are thinking about these.